Ptolemaida (Greek: Πτολεμαΐδα, Ptolemaïda, Katharevousa: Πτολεμαΐς, Ptolemaïs, before 1927: Καϊλάρια - Kailaria) is a town and a former municipality in Kozani regional unit, West Macedonia, Greece. Since the 2011 local government reform it is part of the municipality Eordaia, of which it is the seat and a municipal unit. It is known for its coal (lignite) mines and its power stations. During the Ottoman period, the city was named Kaylar, rendered into English as Kailar; this name was retained in Greek as Kailaria (Καϊλάρια) until 1927. Kailar refers to the Kayı tribe, the tribe of Osman I, the founder of the Ottoman Empire. The modern name Ptolemaida was introduced by decree on January 20, 1927, honoring Ptolemy son of Lagus, a comrade-in-arms of Alexander the Great, and his daughter Ptolemaïs, who are said to be originating from that region. His statue stands in the central square of the city. According to archaeologists, the Ptolemaida region has been occupied since 6000 BC. Archaeologists, in November 2005, discovered the remains of two farming villages dating back to the Neolithic period. A press report notes that such farming villages were trading centres and had a "developed knowledge of metalworking". A golden necklace dating to roughly 4500 BC was discovered on February 16, 2006. Associated Press reporter Costas Kantouris describes the item as a "flat, roughly ring-shaped [which] probably had religious significance and would have been worn on a necklace by a prominent member of society." Lately in the lake Zazari near Ptolemaida there were found 16 houses that belong in the Neolithic era due to archaaeologists. These houses were in the lake and were exposed because of the decreased water level of the lake. That particular small settlement gives information about the society and the people in the Neolithic era. In the area of Ptolemaida many archeological findings have occurred in the last 30 years due to mining operations. Ceramic artifacts, dating to the 6th century BC have been found at two sites near Grevena and Ptolemaida. Archaeologists found the artifacts at two prehistoric farming settlements. Two Ancient Macedonian graves have also been found in the area of Ptolemaida, dated from the 5th century BC. At various times, Ptolemaida was part of the Latin Empire, the Kingdom of Thessalonica, the Empire of Nicaea, and the Despotate of Epirus. The borders among the Latin Empire, the Empire of Nicaea, the Empire of Trebizond, and the Despotate of Epirus are very uncertain. During the Ottoman period, Ptolemaida was called Kayılar, and it had two parts: Aşağı Kayılar and Yukarı Kayılar. Aşağı Kayılar was Bektaşi and Yukarı Kayılar was Rufai, Hanefi. Before 1360, large numbers of nomad shepherds, or Yörüks, from the district of Konya, in Asia Minor, had settled in Macedonia; their descendants were known as Konariotes. Further immigration from this region took place from time to time up to the middle of the 18th century. After the establishment of the feudal system in 1397, many of the Seljuk noble families came over from Asia Minor; their descendants may be recognized among the Beys or Muslim landowners in Kayılar. At the beginning of the 18th century, the Turkish population was quite considerable, but since that time it has continuously decreased. A low birth rate, the exhaustion of the male population by military service, and a large mortality from epidemics have brought about a decline which has lately been hastened by emigration. The Turkish rural population around Kayılar was mainly composed of Konariot shepherds. In the late 19th and early 20th century, Ptolemaida was part of the Manastir Vilayet of the Ottoman Empire. Ptolemaida was taken by Greek forces on October 15, 1912. Ptolemaida's football club is called "Eordaikos" (Greek: Εορδαϊκός). Other teams include AE Ptolemaidas. 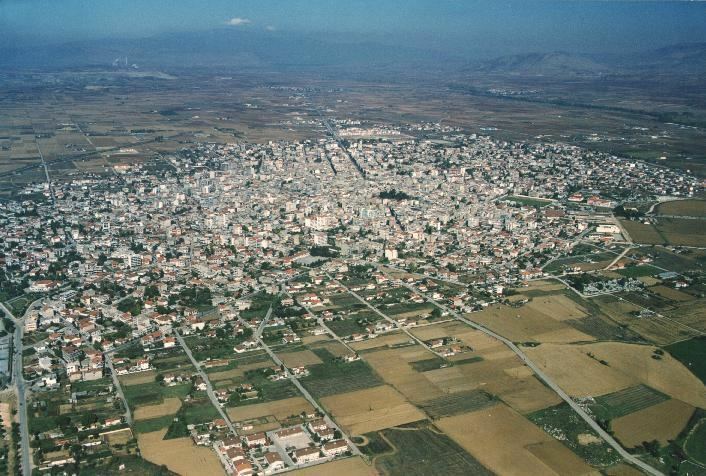 Ptolemaida has schools, lyceums, gymnasia, churches, banks, a post office, a train station (Kozani - Florina), a police station, a water tower, and squares (plateies). There is the potential of a university being established by the state in the near future. The Anthropological and Folklore Museum is based in the town. Ptolemaida is a highly industrialized area. The four power plants in this area produce 70% of Greece's electrical power, using the large local deposits of lignite as fuel. The plants are owned by the Public Power Corporation (DEI), the major employer in the city. The plant was dedicated by the prime minister of Greece at that time, Constantine Karamanlis. The other two are in Amyntaio in Florina regional unit and in Agios Dimitrios. The city, situated in the middle of the Eordaia plain of Western Macedonia, has a humid continental climate. Summers can be hot with thunderstorms in unsettled spells, whereas winters are among the coldest in Greece. It was here that the absolute low temperature record of Greece was recorded (−29.6 °C (−21 °F) on 27 January 1963). The current municipal unit of Ptolemaida is constituted by the city of Ptolemaida and 11 small communities. At the 2011 census, the population of the city was 32,142 residents. The total population of the municipality Eordaia in 2011 was 45,592 residents. A substantial proportion of Ptolemaida's residents are Pontic Greek or their descendants. These were refugees from Asia Minor who first arrived in Macedonia during the 1920s as a result of the population exchange according to the Treaty of Lausanne. The original inhabitants of the neighbouring villages were of Slavic extraction who had settled the area in the 6th century. The city lies in the valley of Eordaia, between the Askio mountains to the southwest and the Vermio mountains to the northeast. It is located north of Kozani, east of Kastoria, south of Florina, and south-west of Edessa. The municipal unit has an area of 217.901 km2, the community (the city proper) has an area of 57.508 km2. Motorway 27 (Kozani-Florina, part of E65) passes east of the city. Ptolemaida was the seat of the former province of Eordaia.